Small 4 Style: Do La La: Pouf at Mockingbird Station + SMU Special this Friday! Do La La: Pouf at Mockingbird Station + SMU Special this Friday! With so many blowout salons popping up in Dallas, it's difficult to know which one is the best without some trial and error. And while they're all good, my favorite so far is Pouf at Mockingbird Station. It's a fun, relaxing place to get your hair and makeup done in a really cute atmosphere. I stopped by today and got my hair done just for fun. Allison did a fabulous job on my voluminous curls! I recommend asking for her. She did exactly what I wanted. Plus, she gave me some awesome hairstyling tips! SMU Students in Dallas for the summer... Listen up! 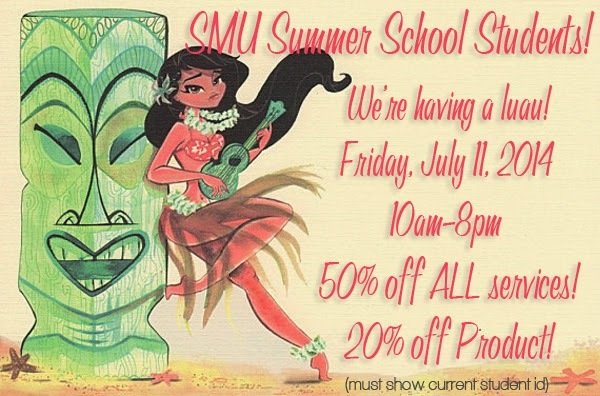 This Friday, SMU students get 50% off all services and 20% off products. Take a break from summer school studying to get Pouf'ed... just in time for the weekend. Pouf doesn't just do blowouts, so check out all of the services offered online. Make an appointment on Pouf's website or call them at (972)827-7683. But don't forget to bring your SMU ID!